Fourth and final in a series of articles covering Andrew, Ben, Dexter and Paul’s journey to Operation Sting 2018. 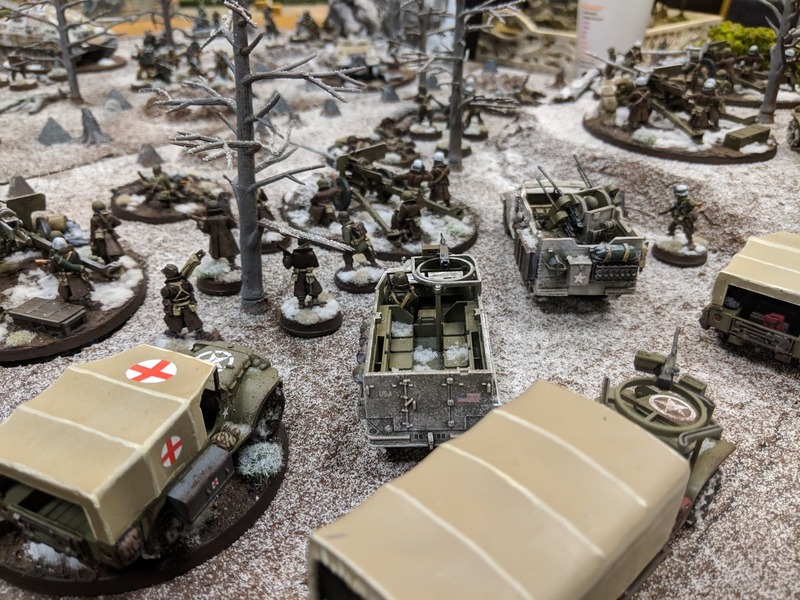 Andrew and Ben – When we started working on army ideas not long after Adepticon and learned that Operation Sting would be set in 1944 this year, the Battle of the Bulge was an easy choice. 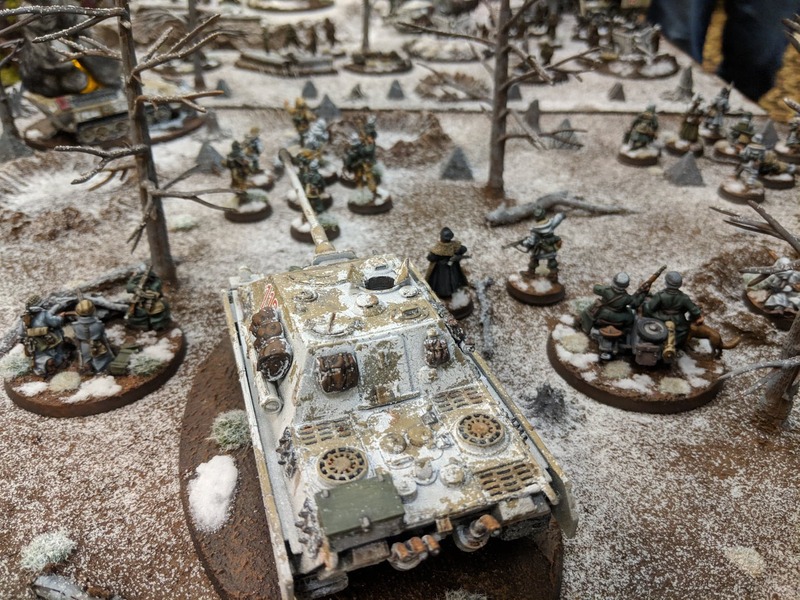 Andrew already had a collection of winter Germans as well as a beautiful Trenchworx Jagdpanther, and I had been wanting to start winter Americans for a while. With both of us having our eyes on the same battle, the idea for “dueling” display boards came up. Over the next few months, we planned it out a bit more and then started the assembly in September. With the help of our good friend Tom and his table saw we quickly built the frame for the two display boards. Each half was left open on one side to allow them to be pushed together to create a unified display for each army. Creating a wooden frame and then adding a layer of pink foam has been a fantastic way to create these display boards. The frame keeps everything in place and intact. The pink foam allows for significant modeling and shaping of terrain features as needed. With the two frames built we added the layer of pink foam (as well as an additional hill on Ben’s side) and then affixed dragons-teeth tank traps, tree stumps, craters, and whole trees. Ben then used Woodland Scenics Flex Paste and Foam Putty to smooth out the hill edges. While doing this we marked out where our units would sit. We also added a handful of sticks to represent areas where trees had been blown to smithereens or were built up as cover. With all the scatter items in place, a double layer of trusty Vallejo Dark Earth was added to the entire board. Let’s be honest, we phoned it in on the painting of the display. When we ended up in crunch time with a significant amount of work on the armies themselves, the boards were not the top priority. The paint for the mud and dirt on the board was done using spraycans, including Games Workshop Rhinox Hide, Army Painter Brown Leather, and Games Workshop Mournfang Brown. Using the three together we were able to add some variation to the browns, as well as picking out the road on Ben’s side of the board with a lighter brown. 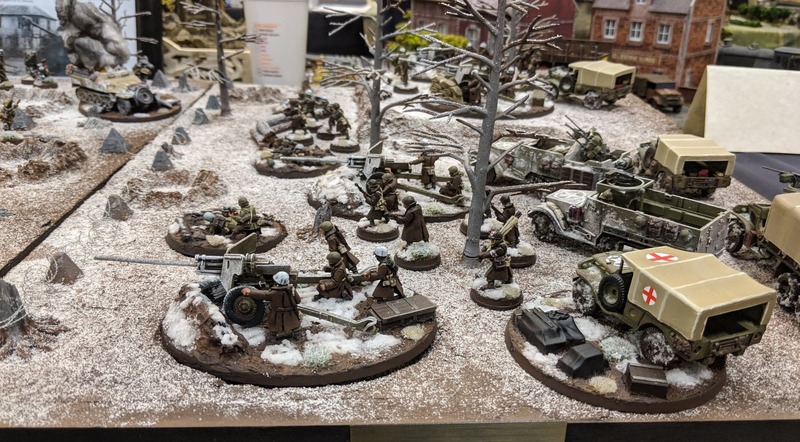 The tank traps received light coats of grey, and and the trees and twigs received a fairly limited quick and dirty of the birch coloring that was applied to the branches that were included on unit bases, mostly using drybrushing rather than painting actual striation. Once these base layers were down, we took a spray bottle filled with a mixture of water and PVA glue (mostly water) and sprayed both boards entirely, and then took a shaker bottle of Woodland Scenics snow and sprinkled it across the boards. Talk about down the wire. 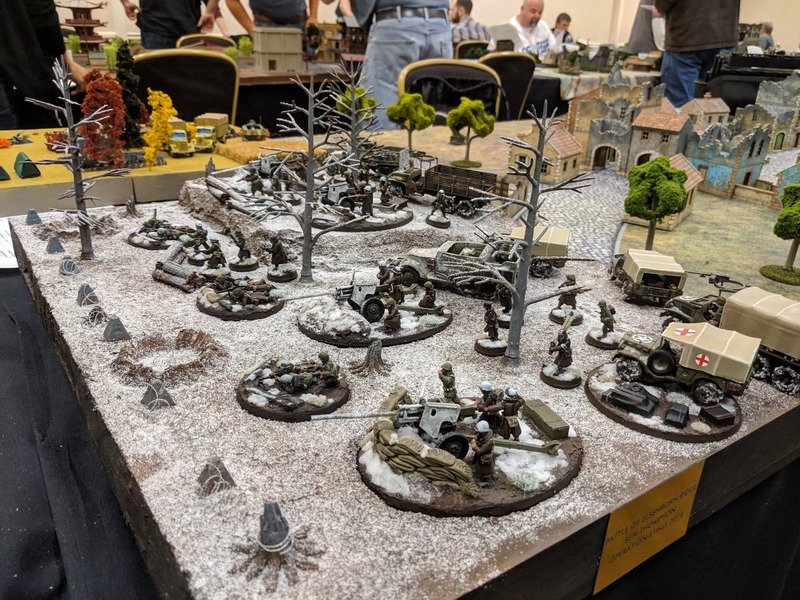 The morning of Operation Sting we strolled into the venue and set up our armies on the displays for the first time. We both took a couple steps back and, I must say, were damned impressed with how it all looked. I sure as hell would have liked to have had more time adding details and final touches but at the end of the day we were more than satisfied with the final product. These boards have some life in them yet, so we may revisit them to make some adjustments and improve the quality for future events and armies. Paul: The idea for the board and army came from a book I read on SAS operations in the Movan Valley, France in 1944. Since I won a box of British Paratroopers who wore the same gear as the SAS I thought this would be a great opportunity to paint an army that was not flat one color. The concept of the board and the army was a lightly armed force hitting the resupplying railway system vital to the German war effort around Normandy and the D-Day invasion. 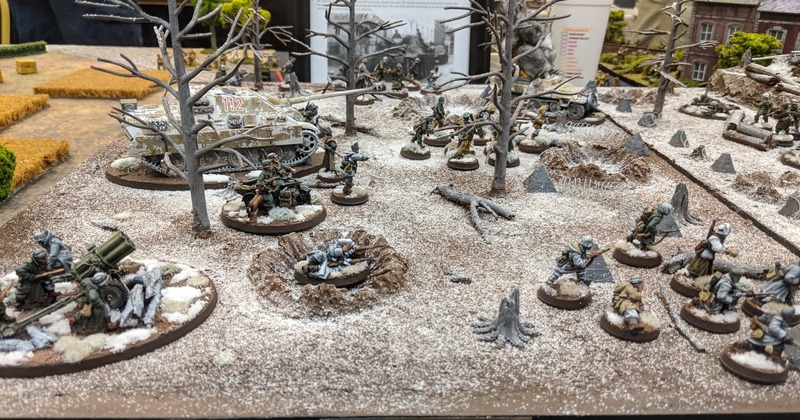 I had a board already built for my German army so I reused that and updated the terrain and overall effect. The buildings are PlastiCraft Ewar 28mm and are robust enough for gaming so they were the first things added to the board along with printed signage and propaganda posters, adding in bushes for the SAS to ambush from and gravel along the railway track the board felt more realistic but the original road was just a sprayed on template so I found rubber molds at Adpeticon from a company called Happy Seppuku, designed for green stuff for which I used air drying clay for keeping the costs down, sprayed black, drybrushed greys and added on some browns, the effect was more of the cobbled road I was looking for. The walls are also from PlastiCraft and are cheap for the amount you get and with some paint and drybrush give a good effect. The trees were from a local hobby store and I based them separately so I could use them on a gaming board afterwards. I was pretty happy with the display and my skills of attention to detail have improved and with anything, the more you do it, the more you improve. The display must have worked as I scored four favorite army votes out of thirty at Sting, which does not sound too good but up against Jeremy who got nine votes, who has won multiple Sting Best Army awards, and Jim who got eight for his awesome Monte Cassino board and has won multiple golden Demon Awards, I was surprised I got what I did! I am excited to move onto other terrain such as scatter terrain for a planned desert board.